Six of the human rights defenders who were detained on July 5, 2017. Images shared widely on Twitter under the hashtag #İnsanHaklarıSavunucularınaDokunma. Eight of Turkey's best-known human rights defenders were arrested during a digital security and information management workshop on one of Istanbul's islands, Buyukada, on July 5. Two trainers were also arrested along with the rights defenders. Police also briefly detained the owner of the hotel where the event was held. Among those arrested is the director of Amnesty International Turkey, Idil Eser. Independent media outlet Bianet reported that police in plainclothes raided the workshop, detained the participants, and confiscated electronic equipment including computers and mobile phones. The eight Turkish citizens will be held for seven days pre-trial. 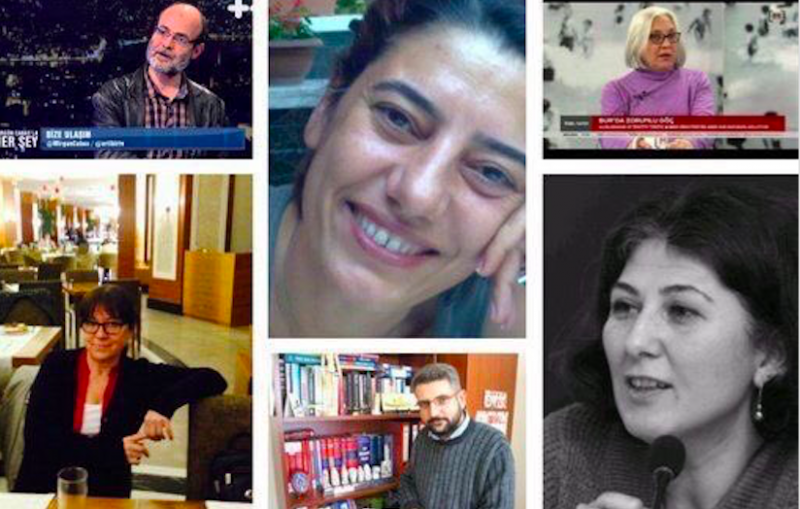 The reaction at home and abroad has been immediate, with Twitter supporters clamoring for the release of the eight advocates, all of whom are experts in their field, using the hashtags #İnsanHaklarıSavunucularınaDokunma and #freehumanrightsdefenders. No information is given to lawyers, journalists, and attorneys. They act as if they just cracked down on some very serious, and very dangerous organization. A group of 17 people, consisting mostly of foreigners, checked in at a hotel in Buyukada on July 15. They held meetings for two days. One of the participants who attracted the most attention was a CIA employee, American professor Henry Barkey. Ahaber referred to the training event as “reminiscent of a meeting ahead of July 15,” but did not offer any details about the who attended the supposed meeting last year. Turkey's AKP (Justice and Development Party) leadership is routinely accused of using last year's coup attempt as a justification for purging the government of non-loyalists and dissolving what remains of civil society and independent media in the country. The country remains in a condition of “emergency rule” that grants broad powers to security services. In this country, anyone can be announced being a terrorist at any time. Even those who have those have only protected the right to life and living. The people mentioned in this news story are people who have dedicated their lives to human rights. A day will come when they will stand for the rights of those behind these vile news stories. The detentions occurred on the eve of EU Commissioner Johannes Hahn's July 6 visit to Ankara to discuss Turkey's troubled accession bid, after the European parliament called for a suspension of negotiations.